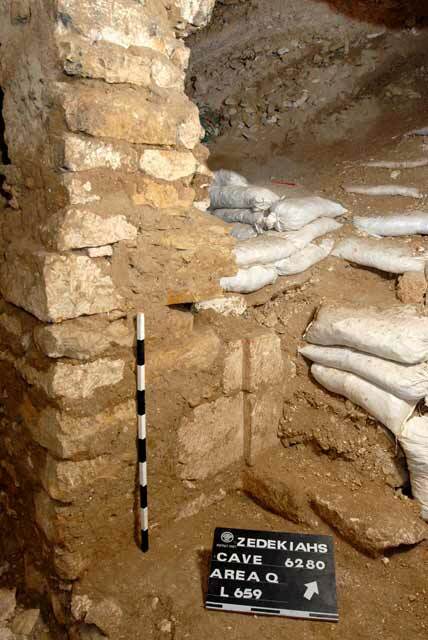 During September 2011, a trial excavation was conducted in Zedekiah’s Cave, next to the Old City in Jerusalem (Permit No. A-6280; map ref. 22198–221/63210–20). The excavation, undertaken on behalf of the Israel Antiquities Authority and underwritten by the Wyatt Museum of Cornersville, Tennessee (USA), was directed by Y. Zelinger, with the assistance of N. Nehama (administration), V. Essman and Y. Shmidov (surveying and drafting), S. Al-‘Amlah (metal detection), A. Peretz (field photography), C. Amit (studio photography), C. Hersch (drawing of finds), Y. Kupershmidt (metallurgical laboratory), D.T. Ariel and R. Kool (numismatics) and volunteers from the United States, Canada, Australia and New Zealand. Zedekiah’s Cave is an enormous quarry extending across an area of c. 9 dunams that was used as a source for building stones over the course of many periods. Its entrance is located in the bedrock base, which served as a foundation for the city wall from the Ottoman period; the cave extends beneath most of the Moslem Quarter. 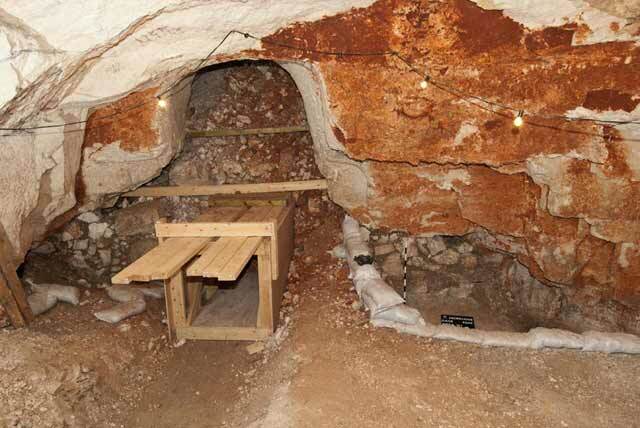 In excavations conducted in 2000, 2002 and 2003 (HA-ESI 119), the cave was surveyed and trial squares were opened with the aim of dating the periods during which it was used. 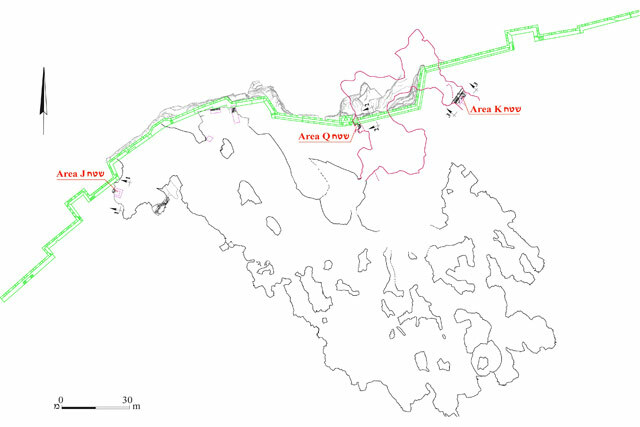 Two areas were excavated in the current excavation, in the lower level of the cave, which is not open to the public (Fig. 1). A wall that adjoined a floor in Area K and a hewn and built opening was revealed that accessed an inner cavity was excavated in Area Q. Area J was excavated in the previous season (Permit No. A-6166). 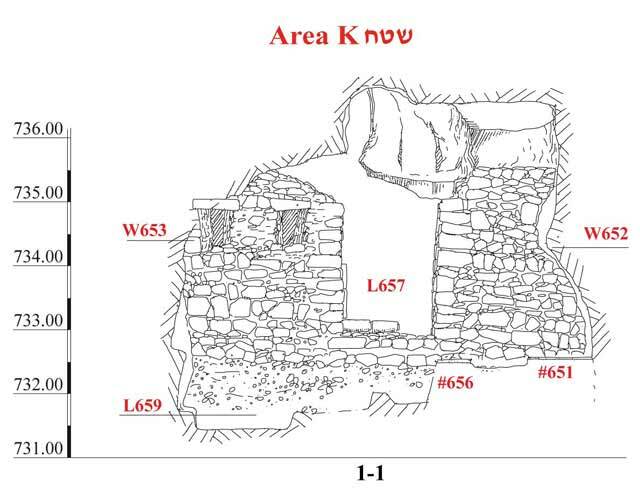 Area K. Remains of a wall that delimited a closed space with an opening in its center were exposed (Figs. 2, 3). The opening (L657; width 1.45 m) was built of well-dressed stones and opened south, toward a threshold (width 0.94 m). A locking mechanism with a square depression (0.15×0.15 m) for a lateral bolt (Fig. 4) was found in the middle of the western doorjamb and a similar hole in the threshold was used in conjunction with a vertical bolt. The wall east of the opening (W652; 1.2×2.4 m, max. height 2.8 m) was built of seventeen courses of irregular stones, some of which were probably fragments of stone debris bonded with mud and plaster. The wall west of the opening (W653; 1.1×2.8 m, max. height 3.45 m) was near the side of the cave, and therefore its height varied in accordance with the line of the rock-cutting in the cave’s ceiling. Two niches in the wall, whose southern façades were larger than their northern ones, were built 1.2 m above the entrance threshold (the eastern niche: southern side 0.5×0.6 m, northern side 0.25×0.65 m; the western niche: southern side 0.52×0.55 m, northern side 0.24×0.58 m; see Fig. 2). The niches were built as a cone, tapering northward, similar to the firing slits in the Ottoman city wall; however, due to their location underground and not having any connection to the fortification, they were probably used as wall closets for storage. The wall was set on a foundation that protruded 0.40–0.65 m beneath it and rested atop fill consisting of quarrying debris. Two floors in an enclosed elongated space (5.2×7.8 m) were exposed south of W652. The upper floor (L651) abutted W652 and covered its foundations; it was composed of tamped earth and survived by several sections. The lower floor (L656) was also composed of tamped earth and extended from the eastern side to the built opening, beyond which it did not survive. 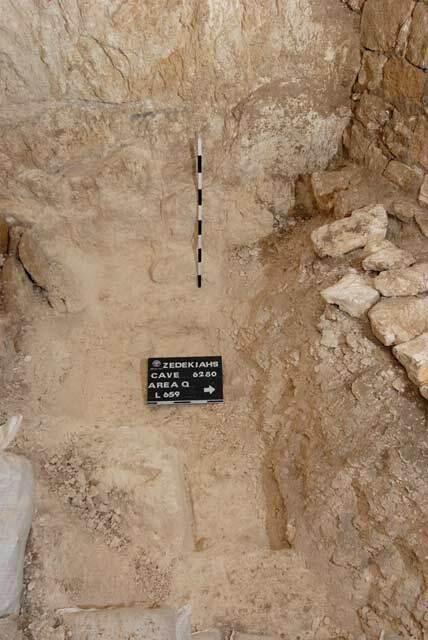 Fill of crushed limestone and quarrying debris (thickness c. 0.5 m) was found in a probe (L659) excavated below Floor 656. The fill had been placed on top of bedrock where traces of rock-cuttings indicative of quarrying and the detachment of stones had survived (Fig. 5). The fill contained potsherds, including a krater (Fig. 6:1), cooking pots (Fig. 6:2, 3) and a lamp fragment (Fig. 6:4), dating to the Byzantine period, as well as a lamp fragment (Fig. 6:5) dating to the Early Islamic period. Two coins were found under the floor and identified as Zandjid, dating to the twelfth century CE (IAA 141505, 141506). It therefore seems that the wall was built in the second half of the twelfth or the early thirteenth centuries CE. Area Q. 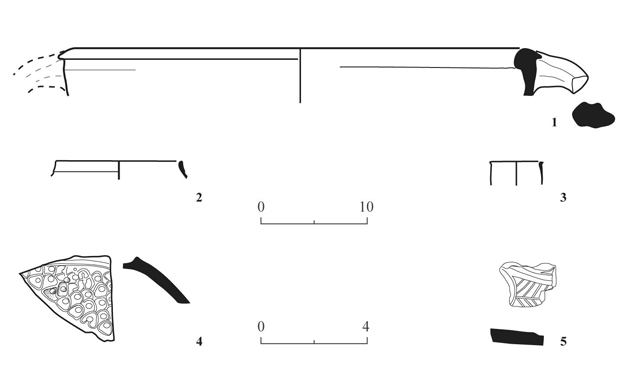 An opening was surveyed in the western side of one of the halls, below the upper level; both its upper arch-shaped part and lower part were hewn (1.2×2.2 m, 2.1×2.8 m respectively; Fig. 7). Doorjambs were built on either side of the opening, adjoining walls constructed from roughly dressed quarrying stone debris (the northern doorjamb 1.2×2.2 m; the southern doorjamb 1.4×1.7 m). The walls closed the gap between the surface of the hewn bedrock and the floor of the cave. On the front of the northern doorjamb was a square stone, into which the bottom socket of a door pivot was hewn (0.10×0.12 m). The upper socket (0.12×0.16 m), 1.85 m above the bottom one and in line with it, was hewn inside a meticulously dressed stone corner (0.45×0.57 m). A stone with a lower socket (0.12×0.12 m) was also located in front of the southern doorjamb, and an upper socket (0.10×0.13 m) above it was hewn inside a square corner (0.3×0.3 m). Dangerous stone collapse inside the rock-hewn opening precluded any attempt of excavating and going into the cavity that was delimited by the hewn entrance. 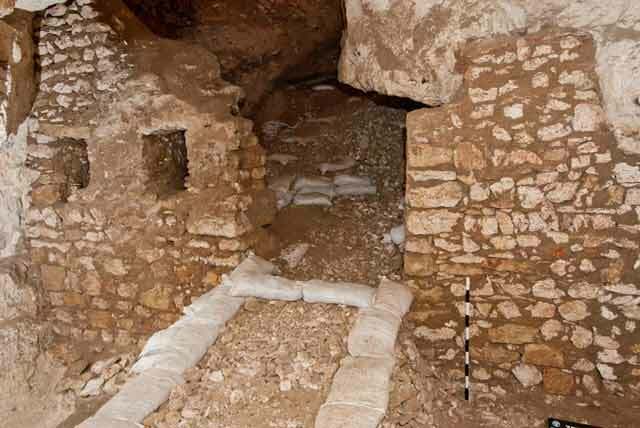 Two trial squares that were opened alongside the opening in front of the walls were excavated to the bottom of the cave (max. depth 0.5 m). No finds that could aid in dating the construction of the walls and hewing of the opening were recovered; however, eight coins discovered in the hall adjacent to the opening were dated to the Zandjid dynasty and two of them to the Crusader period: one was identified as minted in Béarn, France in the late eleventh or early twelfth centuries CE (IAA 141501), and the other dates to the reign of Baldwin III (1143–1146 CE; IAA 141510). The excavation in new areas in Zedekiah’s Cave enabled us to gather additional information regarding the periods during which the lower levels of cave were used. It seems that the wall and floor in Area K were used as a corner for resting and possibly even for sleeping by workers in the quarry during the Late Islamic period. It is still impossible to determine the time when the large opening was hewn in Area Q and only further excavation inside the cavity will enable its dating. 2. Area K, section looking north. 3. Area K, general view to the north. 4. Area K, the locking mechanism, looking northwest. 5. Area K, the quarry beneath Floor 656. 7. Area Q, general view to the west.